November 23, 2011 Dan O. Now I know that I definitely have to stay away from my wife’s sisters from now on. 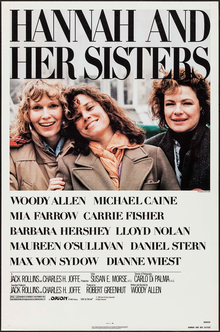 The film is a tale of three sisters-Hannah (Mia Farrow), Holly (Dianne Wiest) and Lee (Barbara Hershey-who are all unique and special in their own little ways, but they all have problems when it comes to their men and love life. Taking place over two years, we see their struggles, pleasures, and problems as they come to grip with life. This film goes into some gross places considering the fact that one of sister’s own husband starts boning around with another sister, however Woody Allen is an amazing writer and makes even the weirdest and craziest of things work somehow in his own little cooky way. I think one of the main reasons being is the fact that he’s able to balance all of these stories, topics, and genres so well that it almost is too hard to take your eyes off the film and rarely does your mind ever go somewhere else. This is also one of the films in Allen’s career where a lot of it feels very realistic because not only does he use that hand-held camera that makes me feel as if I’m right there with these characters, but the fact that a lot of what these people go through and talk about all ring true. I mean we’ve all gone through these feelings at one point or another (not necessarily the boning of your wife’s sister, but you know what I’m saying…) and because of these very interesting characters, it’s also even easier to relate to. There is a lot to enjoy here but I really have to give some love to Woody who does a great job of keeping this film very interesting and not trying to bog it down with a lot of his annoying themes and messages he always tries to get across in his films, but here they don’t really get in the way all that much. Except for the whole religious angle which I kind of felt was a little forced and out-of-nowhere. I mean maybe Woody was trying to satirize and bring out some questions within the fact of Christianity, but I didn’t see any real reason for this, except for how it kind of ties together in the end. I was very glad to see Woody taking a back seat to this cast, and letting everybody strut their stuff and do a bang-up job. All of the girls are all very interesting in their own right and it also helps that each one is played exceptionally well, although I do think we could have gotten to know more about Hannah, considering she is the one who is named in the title and she’s the one sister the film pay’s attention to the least. Michael Caine actually won an Oscar for his role as Elliot here and I have to say he deserved it because he is just great to watch. 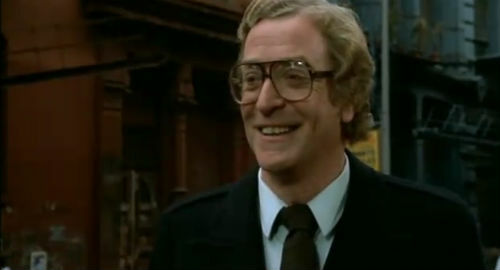 Caine’s character is the one who is dicking around on his wife and that calls for many emotionally-strong scenes where he just does not know what he wants, much like everybody else from the whole film, except this guy is actually doing something bad. Caine owns almost every scene and it’s a real great change of pace for him considering he’s not always in every scene and not being terribly witty. Consensus: Hannah and Her Sisters is a great Woody Allen flick because it balances out heart, darkness, humor, and tenderness all so well with a very well-written script, and performances from everybody involved that add so much more dimensions to these already interesting characters. Oh and it also has Thanksgiving din-din in the film so watch it around that time. Not a big fan of Woody’s work with a few exceptions. But I hear this is one of his best and your review makes me keen to watch it. The realist handheld camera and Caine’s performance both seem like good reasons to give this a go! It is definitely a good reason to see this Allen flick. Thanks Pete! Hope you like it my dood! My favorite part of the movie is Max Von Sydow’s rant on television. I thought that was a nice spot, and more because I think it was Allen’s thoughts speaking through him. Thanks Chris! This is my 2nd favorite Woody Allen film not only because it’s funny but also for being very real about the way characters are portrayed and the idea of family. My favorite sequence is where Dianne Weist and Carrie Fisher are going on a tour of the great architectures of NYC with Sam Waterson showing them. It’s such a great scene. That’s a good one but my favorite is when Caine is telling himself how he’s going to tell his wife’s sister that he doesn’t want to be with her anymore, but she calls him and is obviously wanting him. Great scene for a very great film! Definitely a great Woody flick: “If Jesus came back and saw all that was done in his name, he’d never stop throwing up.” The use of ee cummings is unforgettable. It does have a warm atmosphere even though some of it here feels a little freaky considering all of the spouse-swapping. Thanks Andina! This is my favourite Woody Allen film, ranks above Annie Hall and Manhattan. The dynamics between the sisters, as well as the individual stories arcs that occur, is fantastic from a screenwriting standpoint. Plus, like you mentioned, Allen makes the right choice in taking a backseat and letting the rest of the cast shine. Great review. This is in my top-5 favorite Woody Allen films, for all the reasons you state in your review. I also really liked Woody’s small role in the picture (a favorite scene is when he stops into the movie theater and watches The Marx Bros. DUCK SOUP). One of the four Woody Allen films I’ve really enjoyed apart from Manhattan, Annie Hall and Midnight in Paris. Caine was really good.